Deph's New Mouse (Logitech G600) Review and Setup. I wanted to make a post regarding my new mouse, the Logitech G600 since I know many of us use Razer Nagas, and this is Logitech's version. Finally! Posting it in this forum as I also go into detail on how my keybinds and bars are set up in WoW. Just in case it's useful to somebody using a similar device setup. Not going to bother posting an image, it's a Naga with left and right scroll, and a "third" mouse button on top, for your ring finger, designed to be a modifier key. By default this key just makes all the other buttons on the mouse act as though the CTRL key is pushed... But I wanted to bind it to CTRL to use as a modifier key for other stuff as well... So that's what I did! The number one reason I wanted the mouse. It uses Logitech's Gaming Software, which is pretty much the best toolkit out there for binding your keys, making macros and such. 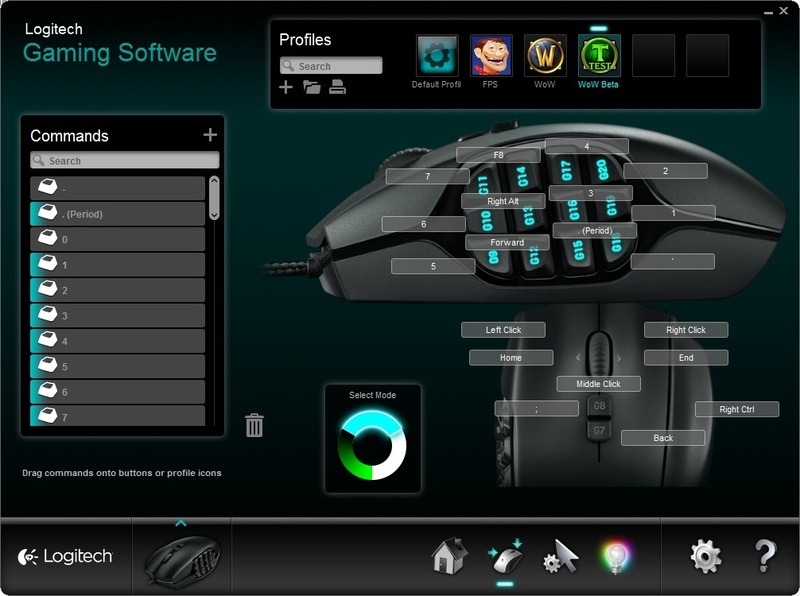 Linking it to the profiles I use for almost every game on my G13. I always disliked the Razer software. Thumbpad on the G600 curved so you can tell the buttons apart much more easily. Like all of Logitech's gaming mice, it has a lot of different customizability options, including DPI shift, customizable per game. When I say "DPI Shift" I mean it, you can bind a 'modifier key' style button to shift the mouse's DPI... and since it uses the Logitech Gaming Software, that button is now a pinky key on the G13 (for FPS games) letting me hit it with my left hand, rather than having to (sometimes) press 3 buttons on the mouse simultaneously to use the functionality. Last, and definitely least: LED lighting changes colors along with my G13, and it matches it perfectly. Can change based on profile, best indicator as to if it fucked up and didn't load the game you're playing's profile ever. And now I don't feel I need to make all my G13's profiles BLUE to match the Naga... WoW is now Monk aqua FTW! Unable to bind Left and Right scroll to... Anything, let alone Left and Right Scroll. -- They can be bound to my G930 (headset) and G13 (pad) which... uh... aren't mice... (the "Mouse Function" menu has a "Scroll functions" subheader that the G600 does not have) But cannot be bound to the mouse, lol. G series devices do not have the capability to support unified "Modes" I was really hoping Gshift would be able to shift my G13 as well, but it doesn't. -- No biggy here, just a quality of life thing. Last edited by Deph; 08-30-2012 at 10:02 PM. TLDR UI and Keybind setup. The G13s two Bartender bars page with Ctrl, Alt, and Shift. 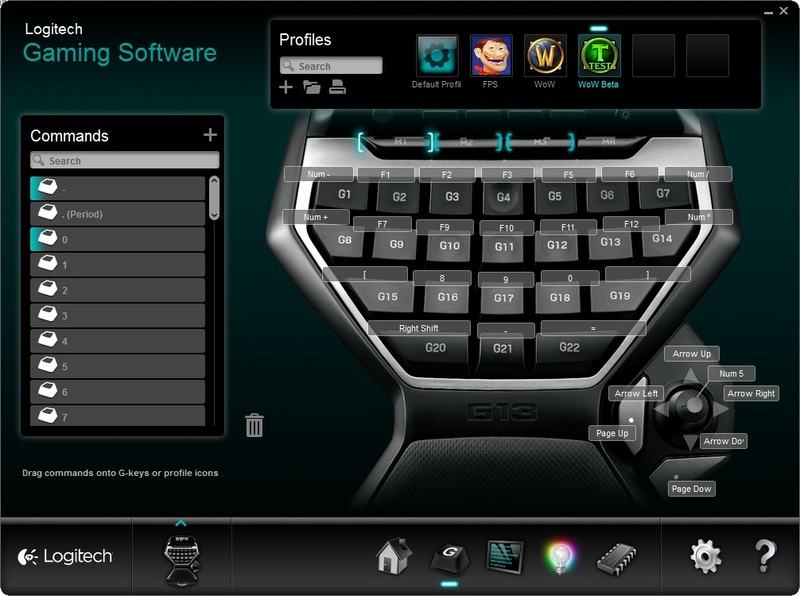 The G600 bar pages to the same secondary bar when any modifier key is pressed. This uses all 10 bars, all 120 buttons. I, of course, use only a portion of them, but it's nice not having to make modifier key macros, lol. SHIFT is secondary abilities, CC, PVP crap I don't use often in raids, all that junk a lot of people just never bother keybinding. CTRL pages to Heals (or DPS, if I'm a healer) -- Which is nice if I respec between heals/dps, just swap the profile in bartender to swap all the buttons! ALT is self cast heals, buffs, potions, flasks, weapons for swapping, that sort of stuff. -- Alt self cast is a lifesaver on a healer in PvP. In-game screenshots and graphics to follow, UI is a disaster right now just to make it work for the raid tonight. I customized my keybinds to keep buttons I'm more likely to accidentally hit on the keyboard from having important cooldowns bound to them. Here's a spreadsheet I made to help me figure it all out. I'll make some much nicer graphics once I know I've got the binds how I want them... Need to mess around on the beta first. This list does not include what keys can be HIT with modifiers (paging bars, macros, etc) nor does it detail which buttons have bizzare keybinds when you press a modifier (like the numberkeypad becoming home/end/del etc) It also doesn't point out that, if you use the alt key at all, binding F4 is a disaster waiting to happen. Last edited by Deph; 07-23-2012 at 05:30 PM. Great review. I have the Razer Naga and like it, but would have purchased the G600 if given the option today. Personally, I find the Naga to be a bit small, so if you have smaller hands it would fit you well. The G600 looks like a great product with a better ergonomic layout of the side buttons. I find on the Naga it's hard to use buttons 7-12 and have relegated myself to only using the 1-6 with Shift/CTRL/ALT binds. Still plenty for my setup. I haven't messed with the G600, but my G5 was a great size for my hand and have found Logitech to sometimes be a little larger form compared to Razer products. Also, I like the fact that the G600 has the left and right scroll... Basically I'm a little jelly right now of your mouse!!! Oh yeah, I neglected to go into detail about how the thumbpad felt. The Naga's size worked good for me as I tend to hold the mouse with my fingertips rather than palming it. -- The G600 is only a little TALLER, and a bit wider (for the third mouse button) - The extra height makes it harder to fingertip grip it, but overall I think it'll be more comfortable once I'm used to it. On the Naga I could barely hit all of the buttons. 1-3 were the very tip of my thumb, and 10-12 were the base of my thumb. Everything in-between was on an indented part of my thumb, and always took me a moment to make sure I had the correct buttons. They lacked the definition to really identify them quickly, so I never felt comfortable putting important things on them. The G600, the top row (1-3 on the Naga, but G9-G11 on the G600) is actually slightly past my thumb-tip but the fact that I can easily identify every button actually makes them easier to hit, even if I have to shift my grip a bit. Meanwhile I already feel as comfortable hitting the buttons with the G600 as I did with the Naga, and I'm sure that's only going to improve. Edit: this problem has been fixed in the latest update. Added a BIG Con. Although it doesn't bother me at all. It's pretty dumb. The "G-Shift" functionality which makes the mouse swap modes when you push a button down, releases ALL BUTTONS (even if you're holding down the key still) even left and right click when you press it. Considering you pretty much LIVE with the right mouse button down for a good chunk of MMO gameplay, this is baaad. I didn't notice myself as I immediately rebound G-shift to CTRL, and never looked back, as it's much easier to just bind the keys in game than play with the logitech gaming software, but noticed it when I went to go use G-Shift with a game that didn't let me change it's keybinds. If I REALLY wanted that kind of functionality, I could always write an autohotkey script to detect the HID input from the mouse and manually script out anything I wanted. -- (I had to do this with the Steel Series MMO mouse when it first came out, as it's software was even buggier than this logitech mess) But that's not something most people aren't up to doing, lol. Last edited by Deph; 08-30-2012 at 10:12 PM. The most recent update fixed every bug and issue I've had for the most part with the G600 save for two issues. • Still unable to bind Left and Right scroll to ... left and right scroll, lol. • Each G series device having it's own modes... Still the same. No big deal here. My name is Brian and I just happened to stumble upon your forum post regarding your G600. Very well done, I'd like to add. May I ask you a follow-up question concerning your configuration? You’ve illustrated that you have rebound "G-Shift" to be "Right Ctrl". I can't seem to get that mapping to stick with my setup. Essentially I am interested utilizing the "G-Shift" to act as my focus modifier for all of my focus based CC abilities such as Clone, Roots, Hibernate, etc. So, my question is how do I convert "G-Shift" into "Ctrl"? I have it set to Right Ctrl because that way I can press it down when I have Left Ctrl hit with my left hand, and release one of the two, without both buttons getting the "up" signal sent. Thank you for your reply. There still seems to be something not quite right about how I'm going about this. I am currently running the latest version of LGS 64-bit (8.35.18) on Windows 7 64-bit. LGS is running in "Automatic Game Detection" mode and in a new profile that I have created for WoW setting the path to the executable manually. Of course I am missing all of the default binds that LGS likes to establish but I’m not overly worried about those. I’ll create them in the future as I feel they become necessary. Current Config: Running AGD mode, custom WoW profile is active and using the 2nd mouse profile defaulting with the num pad for binding options. I enter the binding configuration screen, click on the "G-Shift" button, edit, select "Keystroke", cursor over the binding field and hit the "Ctrl" key on my keyboard. The text over the key now reflects my alteration. It seems that it would be as simple as this but no dice. The desired bind is plainly visible there, however when I enter the "test mode" displaying every keystroke entered the newly mapped "G-Shift" come "Ctrl" key does not display any output. Subsequently it does not trigger my focus modifier in-game either. This leads me to believe that somehow my configuration of the software is the limiting factor. Do you have any additional thoughts in light of the current details? Perhaps the steps I have taken to configure my G600 are glaringly incorrect and you may spot something out of order. I'd suggest posting to Logitech's gaming mouse support forums if you haven't already. If for no other reason than to report what is apparently a bug. A lot of people wipe out problems that sound like yours by deleting all of LGS' settings and starting from scratch. -- I had to do this to fix my LED coloring, which kept defaulting to the original "rainbow" setting, no matter what I changed the setting to. To quote a Logitech Support moderator "Uninstall LGS, delete the settings.json file in C:\Users\%USER%\AppData\Local\Logitech\Logitech Gaming Software\ , then reinstall"